It's June, and I've been on holiday. Must be Alps time! France again this year - third time lucky? ...and then we woke up on Wednesday morning to find it was cold and snowing. Brilliant. Snow turned to heavy rain, the rivers rose and turned interesting colours (Durance was yellow, Guil grey, and Ubaye nearly black). This made me lose enthusiasm for paddling - faster with fewer eddies? eek. I was never going to push myself too much this week anyway, as I mostly just wanted a week in France without horrible long swims, massive bruises and general bad stress. But even so, I probably should have done a bit more. Next time, next time. 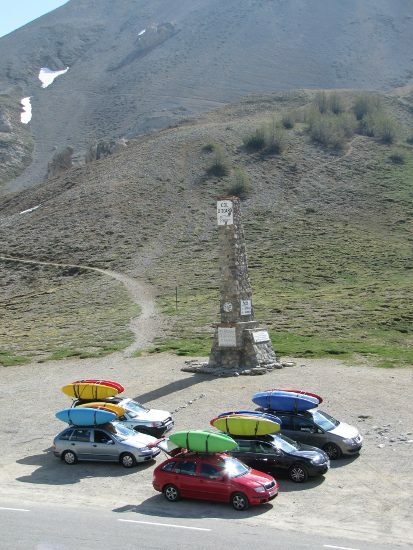 One day most people did the Lower Guil and Briançon Gorge. Both of those would have been good - certainly the gorge is on my mental ticklist (possibly just because it involves a slide, but shh). Unfortunately that day I was suffering very painful sunburn on my upper back, to the point where moving arms/shoulders, or having clothes rub on my skin was enough to bring tears to my eyes. Ow. Before anyone starts on a 'this is why you should wear sunscreen' lecture - I know. I had factor 30 on! grrrr. Rainy weather also meant no via ferrata. I think about half of the group was keen to spend a day doing that, but obviously not on wet slippery rock! But it wasn't all rainy doom and gloom! Plenty of time spent wandering around exploring Briançon - particularly the very pretty old town and fort. The final night we all went for a meal, which involved a massive and very delicious fondue. mmmm, cheese. My limited French skills came into play here, reading menus and ordering puddings for people etc. Language skills were also tested when we found ourselves having to deal with the emergency services at the side of the Middle Guil. The moral of that story being: "don't lose your boat, as it will end up at the hydro barrage where someone will see it and call the pompiers and gendarmes to go and hunt for the person to go with it". That was certainly an eventful day! 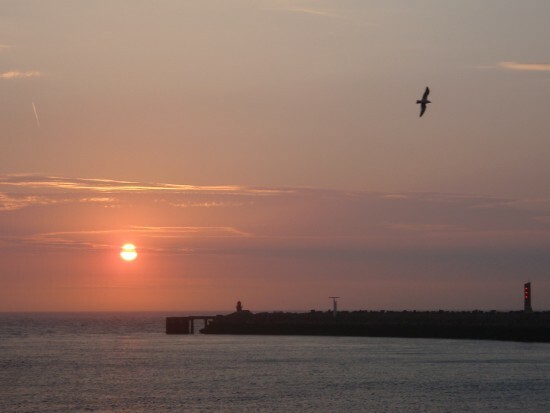 Sunset from the ferry in Calais. Au revoir France! Somewhat typically, the day we drove back it was disgustingly hot (I think we saw 33° at one point) and sunny. Hooray for cars with air con. Nice and windy on the ferry back too - very bracing standing out on deck!